I wish I knew whose blocks I’ve used. I still have some blocks left, but now most of the blocks I received last year are used. 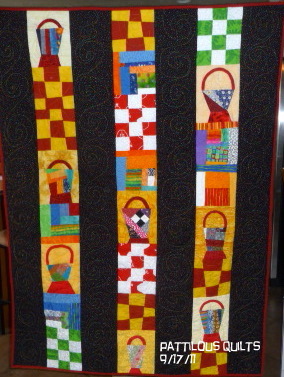 This is my latest quilt from them. Thanks to all whose work went into my quilt! One of those baskets is mine. I like this strippy set. Thanks. It worked up rather fast and fun. I had some wonky 9 pathches and then some others that I added to in order to make the strips. It doesn't show up too well but it's a black with all colors of small dots and the backing is a bright lime green and with the dark red binding it seems to all tie in together well. Those baskets are really great!